What do you get when you collate as many free Google versions of the same text as you can find? Those familiar with Google Books may suggest that you’ll quickly discover rampant OCR errors, or perhaps some truly astounding misinformation in the metadata fields. 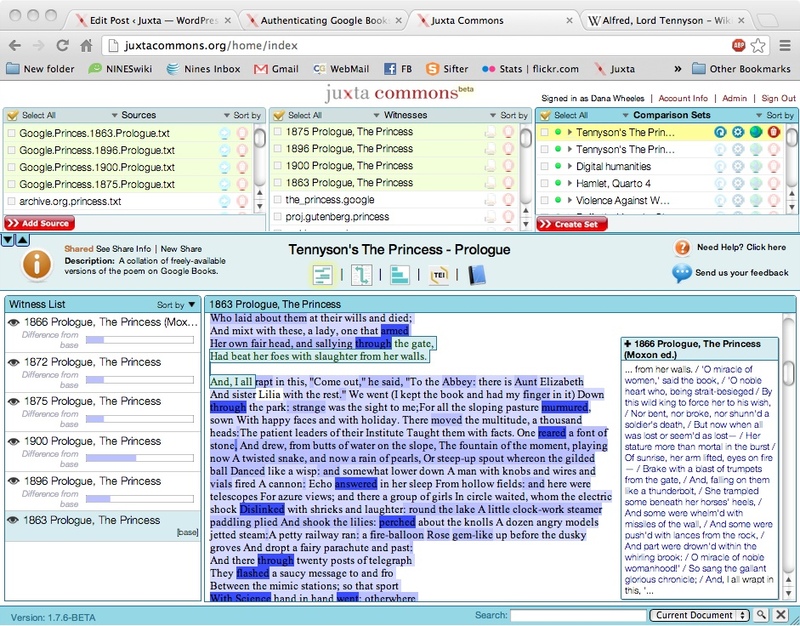 In my experiment using Juxta Commons to explore the versions of Alfred, Lord Tennyson’s long poem, The Princess, available online, I encountered my fill of both of these issues. But I also discovered a number of interesting textual variations – ones that led me to a deeper study of the poem’s publication history. 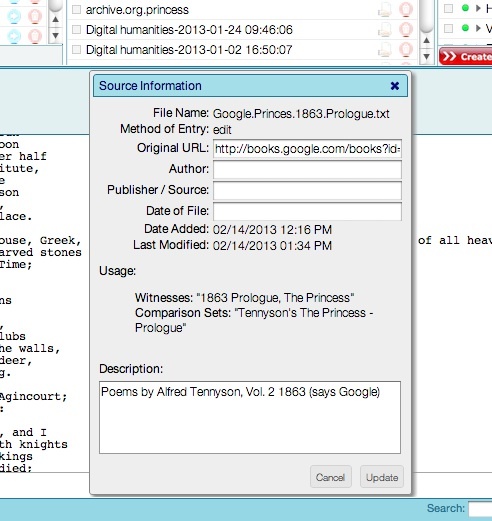 In the process of testing the efficacy of the software, I believe I stumbled upon a useful experiment that may prove helpful in the classroom: a new way to introduce students to textual scholarship, to the value of metadata, and to the modes of inquiry made possible by the digital humanities. Many of the editions of Tennyson’s works offered in Google Books are modern, or modern reprints, and are thus available only in snippet view. Paging through the results, I chose six versions of the Princess that were available in e-book form, and I copied and pasted the text into the text editor in Juxta Commons*. Because the poem is relatively long, I chose to focus solely on its Prologue – not only to expedite the process of collation, but to see if one excerpt could give a more global view of changes to the poem across editions. Another important step was to click on the orange “i” button at the upper left of the screen to save original URLs and basic metadata about the object for future reference. This step turned out to be invaluable, once I realized that the publication information offered on the title pages of the scanned documents didn’t always agree with the metadata offered by Google (see this example). Once the set was complete, and collated, I noticed right away that there were significant passages that were missing in the 1863 and 1900 editions of the poem. Stepping chronologically through the set using the witness visibility feature (the eye icons on the left) showed no apparent timeline for this change (why would it be missing in 1863, present in 1866, 1872, 1875, and excised again in 1900?). The answer could only be found in a robust explanation of the revision and publication history of Tennyson’s work. Without going too deeply into the reasons behind this set of differences (I’ll refer you to Christopher Ricks’ selected critical edition of Tennyson, if you’re interested), The Princess happens to be one of the most revised long poems of Tennyson’s career. The Prologue was expanded in the 5th edition (published in 1853) and it is that version that generally considered the standard reading text today. However, as we have seen from the Google Books on offer, even in 1900, editions were offered that were based on earlier versions of the poem. Could the fact that both versions missing the stanzas are American editions be important? I invite Tennyson scholars to help me continue to piece together this puzzle. However, I believe that in this one example we have seen just how powerful Juxta Commons can be for delving into seemingly innocuous editions of one of Tennyson’s poem and exposing a myriad of possible topics of study. Next time you’re wondering just *which* version of a text you’re looking at on Google Books, I hope you’ll consider Juxta Commons a good place to start. * Please note that Juxta Commons can accept some e-book formats, but those offered by Google Books have image information only, and the text cannot be extracted. 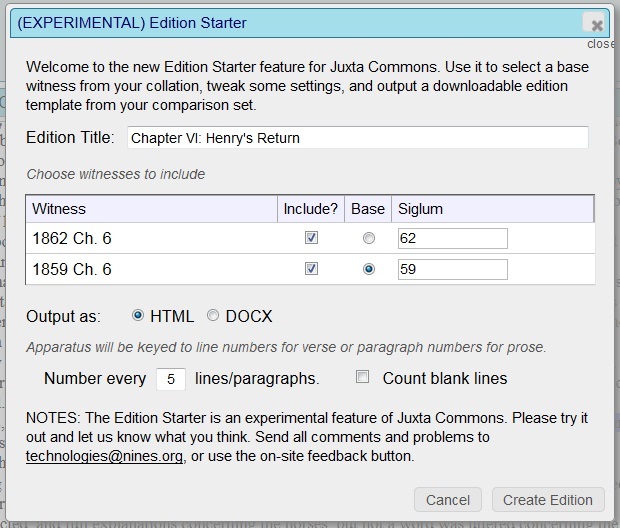 The NINES R&D team is happy to announce a new phase of testing for Juxta online: Juxta Commons. 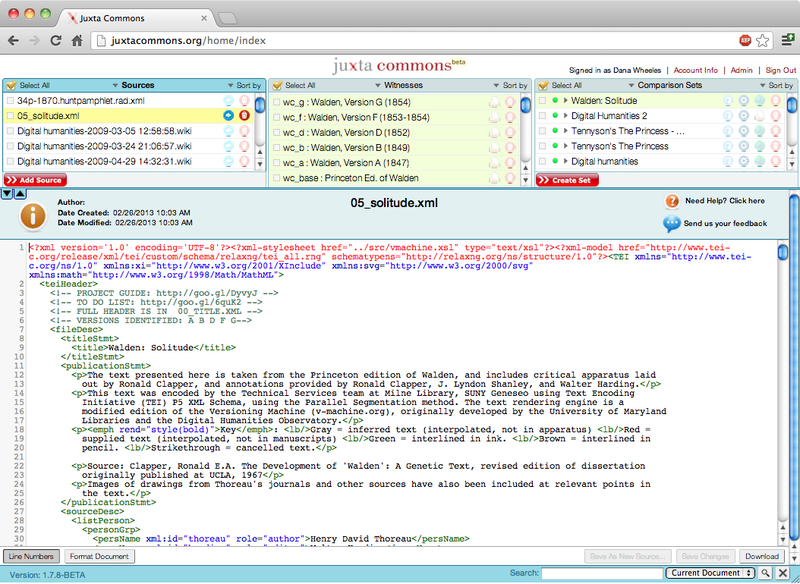 We’re entering our final phase of intensive testing on this new site for using Juxta on the web, which breaks down the processes of the desktop application so you always have access to your raw source files and your witnesses, in addition to your comparison sets. We’ve even added more ways to work with XML, as well as an option to import and export files encoded in TEI Parallel Segmentation. We have invited a group of scholars and users to try out Juxta Commons for the next two months, and share their experiences online. They’ll be exploring new ways to add source files, filter XML content and browse our newly-updated visualizations, previewed in the gallery above. If you would like to be a part of this group of testers, please leave a comment below, and we’ll get in touch with you. I’m a PhD candidate in the English Department at the University of Virginia currently working on a digital edition of Aimé Césaire’s early works under the sponsorship of l’Agence Universitaire de la Francophonie and ITEM. Some of this work also moonlights as my rather schizoid dissertation (read French poet/English Department) and I consider it part of my long-term goal of generating and sustaining enthusiasm for reliable digital editions of neo-canonical Caribbean literary texts. I am rather new to this blog, but not to Juxta. I started working with Juxta around the time when I started working with Aimé Césaire’s signature poem Cahier d’un retour au pays natal, roughly 2 years ago. 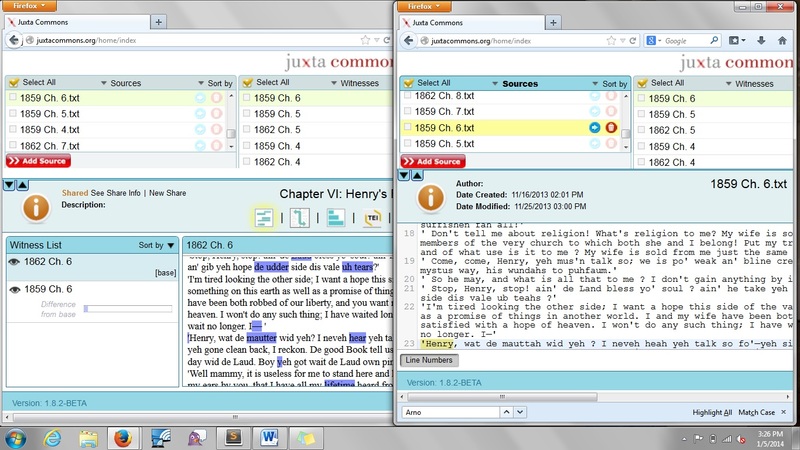 At the time, Juxta saved me enormous amounts of time proofreading my retooled OCRs and generating an apparatus. It was later, when I started working with Et les chiens se taisaient, a longer text with substantially more variants and transpositions, that Juxta revealed to me both its current shortcomings and its ultimate promise. We could say that Aimé Césaire was a migratory poet in the fullest sense: He had perfect pitch for context and used it to quickly adapt his voice to new audiences as his work traveled around three continents. As a student of literature he was as much a product of his Paris education as he was of the journey that brought him there and back to his home base in Martinique. His major works, and the many revisions they were subjected to during his lifetime, provide the final testimony to his restless poetic trajectory. To the textual critic who approaches this corpus for the first time, one feature stands out above all others: The sheer number of transpositions from one version to another. In past conversations, I have likened his stanzas and lines to Lego blocks in order to quickly explain how he seems to have an utter disregard (or is it exactly the opposite?) for sequence. In the case of Et les chiens se taisaient the text begins its life as a three-act play on the Haitian Revolution, has an adolescence as a poetic oratorio with heavy Christian overtones and grows up to be a heavily abstract play about the struggle between universal Slave and Master figures. Throughout this transformation, stanzas and lines are bandied about without care for consistency, sometimes going from one speaker to his or her antagonist in a later version. When I began using Juxta for Et les chiens se taisaient, I only expected the same functionality that was perfect to the T for Cahier d’ un retour au pays natal, but as soon as I started working with the first two instantiations of the text, the manuscript and the oratorio, obstacles and yearnings started cropping up. In its current build (1.3.1), Juxta struggles with long texts with many transpositions. After several meetings with NINES and Nick Laiacona, it became clear that a memory issue combined with the graphic rendering of connectors was the culprit. Apparently, Juxta has a built-in limit to the amount of internal memory it uses from the machine, and rendering the graphic connectors puts substantial pressure on these resources. To account for transpositions, Juxta allows you to mark “moves” manually from one text to the next, creating a list of these moves as you go along in one of the bottom panels. This system is intuitive and easy to use, and complements the automated functions nicely, but it becomes unwieldy in a collection with heavy traffic. While Cahier d’ un retour au pays natal had a total of four, albeit significant, moves in its four major versions, Et les chiens se taisaient has an overwhelming 64 moves just between the manuscript and the first published version! Click here to read the full entry at NINES. 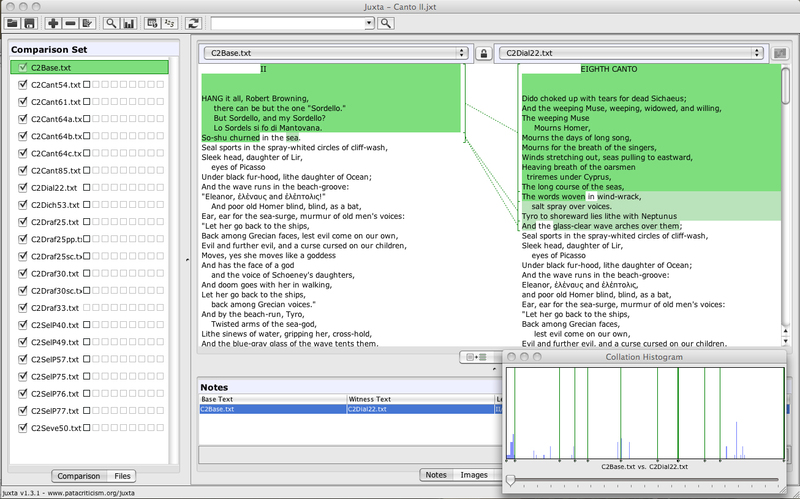 I am currently assembling the digital variorum edition of Ezra Pound’s Cantos with Richard Taylor. This edition aims to collate all published versions of every canto, including page proofs and setting copy, where available, and to integrate digital reproductions of illustrated capitals in deluxe editions, audio and video recordings of Pound reading his poetry, and a very large cache of annals material pertaining to the production of his epic poem over the course of sixty years. We have chosen to use Juxta to collate the very extensive set of variants for each canto – the total number of witness files runs into the thousands – because this application addresses a number of issues inherent in such a project. 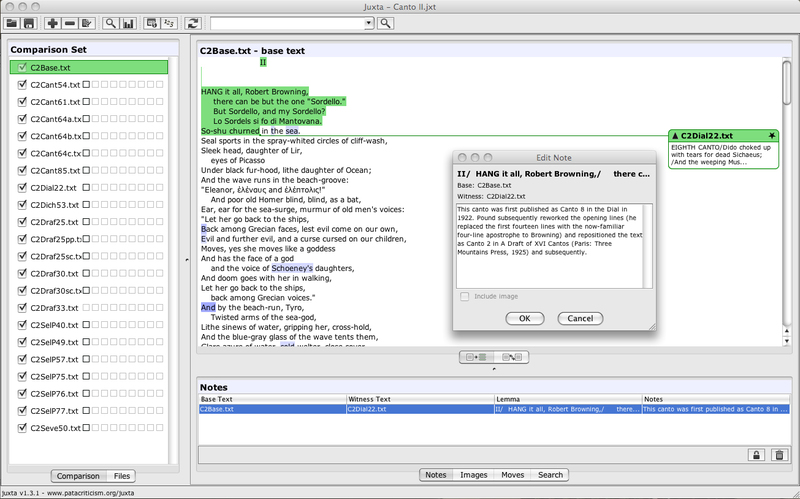 Juxta’s elegant interface provides immediate visual information concerning the kind and degree of variation between the two witness files represented here: the reader is already aware of the canto’s changed status after 1922 from the “Eighth Canto” to Canto II, and can see – immediately – that the heaviest revision occurs in the opening lines, a revision that ushers in the now-iconic address to Robert Browning (the rhetorical and semantic implications of which can be processed by means of careful comparison of the two versions). Variation is visualized in the integrated heat map, and is complemented by the Histogram function, allowing the reader to see exactly at which points the densest variation might occur in the canto. In this case, the beginning of the text bears the most acute variation, but other significant variations occur throughout the canto, including the final lines. To be able to see this at a glance is truly a powerful aid to scholars, even those intimately familiar with the textual state and history of this poem. The complexity of Pound’s text is legendary, and not all bibliographic features can be captured in either codex or digital editions. Yet Juxta provides the means to collate Greek text, including diacritics (seen in the example above), and the increasingly substantial presence of Chinese in later instalments of the Cantos. Indeed, any element present in the Unicode palette can be deployed in a Juxta text file. While those ideograms drawn by hand (often incorrectly) and included in published editions of the Cantos are not represented in the text field, photographic reproductions of them can be added as Edit Notes at precisely where they occur in a particular canto. 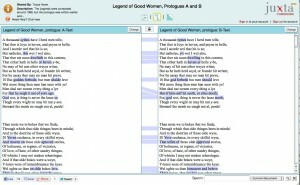 These features provide excellent reasons for the digital variorum edition of Pound’s Cantos to employ Juxta. Potential development of an HTML applet – allowing for an integrated collation function within a web-based edition – is exciting news indeed. Now that Juxta 1.3 has been refined and released, the development team at NINES has been discussing new directions for the software. First and foremost is the adaptation of Juxta’s collating power for texts in languages other than English. Comparisons of texts in French and Italian work pretty well, but we’re still investigating the necessary diacritics to make such operations more exact. However, it seems that scholars working with non-Roman alphabets have been left out of the conversation. Do any Juxta users out there have any experiences with foreign language collation to share with us? Below is a representative page from Christopher Ricks’s critical edition of the poems of Alfred, Lord Tennyson. 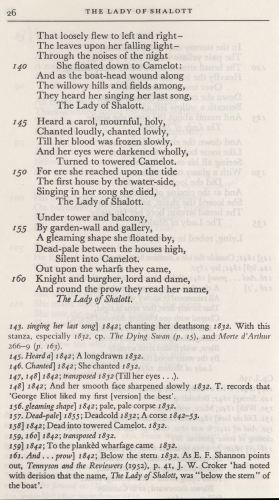 This excerpt from “The Lady of Shalott” illustrates traditional methods of textual collation: the base text is prominently displayed, with variants and annotations included in notes at the foot of the page. It provides a useful comparison to this screenshot of the same poem, collated in Juxta. 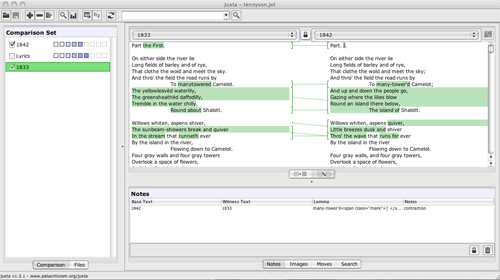 Two versions of the poem can be displayed in Juxta side-by-side, with a heat map of the differences (highlighted in green) making variants instantly recognizable. But in addition to these basic visualizations, the new Juxta 1.3 adds another useful feature: search.